Sculptural and curving lines combine with chrome-plated construction to give this 6-bottle wall-mounted wine rack a distinctively modern look perfect for displaying favorite vintages in contemporary decors. Seemingly made from one uninterrupted piece of wire, this elegant wine storage rack keeps bottles properly stored horizontally, and displays them on their sides for easier identification and facilitation of conversations with fellow oenophiles. Whether used singly or as part of an array of multiple units, this artistic bottle rack makes a functional and decorative addition to any connoisseur's collection. 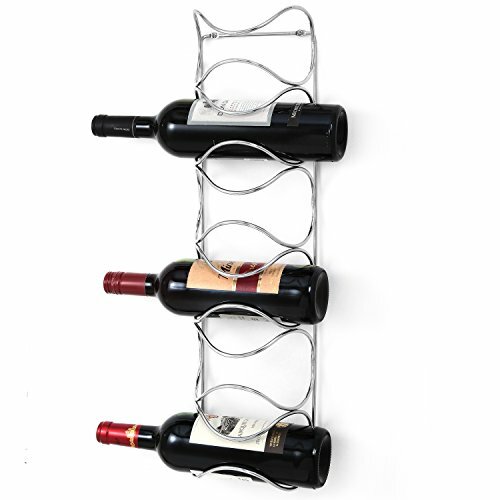 Approximate Dimensions (in inches): 24.4 H x 6.9 W x 4.1 D.
Contemporary design chrome-plated steel wire 6-bottle wine rack. Elegant curved wire and chrome-plated construction create a modern look to complement contemporary decors. Designed to hold bottles horizontally for proper storage, and displays bottle sides for easy identification. Store up to 6 of your favorite bottles of wine in your kitchen or dining room. Wine bottle not included.